There was a special atmosphere lingering in the air at the orphanage in the evening of December 19th. It was a Christmas party! So not only did we play & have fun, but most importantly had a special long-awaited guest: Santa Clause arrived with gifts for the kids. The children were totally thrilled: they swarmed round Santa eagerly trying to win his attention & touch his red velvet cloak & white long beard. 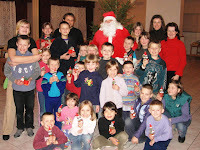 Each child got a meaningful gift from Santa: a tiny cactus decorated as a Santa Clause (with a red cap, beard, moustache fixed on it). Some of those orphans had not seen a Santa “live” before. No surprise they were so exited & happy! Our Santa was played by a our volunterr from the local christian community. He was a very genuine Santa indeed! Except maybe for jeans he wore which caused some confusion among the little ones.. There were about 40 kids at the party.